Last weekend, my family and I visited Great Wolf Lodge in Mason, OH. 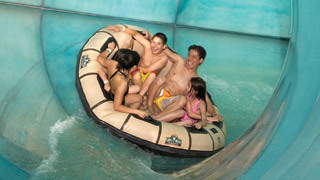 It’s right next to King’s Island Park and a great place to get away for some indoor waterpark fun during the cold winter months. I’ve got 5 kids under age 10 (plus one on the way) and cabin fever can take on an ugly face at our house. 🙂 GW does a great job online of showing you the rooms and letting you make reservations online. Because I’ve got a large family and I wanted to get the details right, I chose to confirm my reservations on the phone with a GW customer service rep. At the end of our call, the rep suggested we use one of their playpens for our 15 month old. I took her up on the offer. One less thing, right? That’s where Lawson stepped in and saved the night. He sent someone to buy a new playpen at WalMart. It arrived just in time and our baby boy slept wonderfully in his brand new, never been used, playpen. Thanks to Lawson for taking it upon himself to send someone out just for us and thanks to GW for providing a culture where people do what it takes to solve problems with short notice. The Lesson: Dropped balls are part of being in business. It’s your willingness to dive on dropped balls that sets you apart from the pack. Reminder: There’s never a better chance to win the customer service game than when you are dealing with people who aren’t at their best and really need your help. Wow, that could have ended SO badly!! They almost under-delivered on something that you werent initially expecting in the first place! But since they offered to provide a play pen, of course now you were planning on having it. I’m so glad Lawson stepped up to make it right, and its a great example of QBQ too.